Just 10 days after a wing 'clipping' incident between a taxiing Aerolineas Argentinas Airbus (with over 200 passengers on the arriving aircraft) and an Air France 777-300 plane parked at a 'gate' preparing to depart for Paris (over 300 passengers onboard) another airside event took place at the Miami International Airport in America. It was on Monday 28th January, 2013, when Automobili Lamborghini played out a media stunt at the Miami Airport when five new Lamborghini Aventador LP 700-4 Roadsters sped down the south runway of the busy airport. 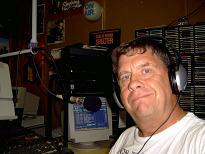 With authorisation from the Federal Aviation Administration (F.A.A.) and Miami-Dade County the Lamborghinis exceeded the passenger airliner take-off speed on a runway. Between 150 mph and 180 mph is the 'norm' for a passenger jet airliner to lift-off from the runway. No current jet aircraft reaches 210 mph on the ground, which was the 'clocked' speed of the 700-horsepower vehicles during the closed-course drive demonstration. 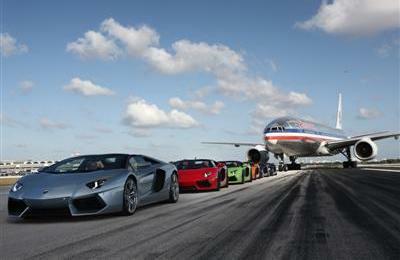 Prior to the high speed demonstration, the Lamborghinis were joined by an American Airlines Boeing 777 and lined-up for a photo shoot on the runway. Due to advanced planning on behalf of Miami-Dade officials and the FAA, there was no effect on flight arrivals and departures at the four-runway airport. The event, the kick-off of a 10-day publicity and dealer education programme, began with an unveiling press conference in Lummus Park at Miami Beach. The ceremonies continued with a 50-vehicle parade down Collins Avenue in South Beach before culminating in the runway drive. Lamborghini executives hosting the event included Stephan Winkelmann, President and CEO of Automobili Lamborghini S.p.A., as well as Maurizio Reggiani, Director of R&D, Raffaello Porro, Director Communications and External Relations, and Filippo Perini, chief designer. The Aventador Roadster is the newest open-top version of Lamborghini’s flagship vehicle. With a 700-horsepower, 6.5-litre V12 engine, the Aventador Roadster reaches 60 mph in less than three seconds and boasts a top speed of 217 mph (where legal). The vehicle’s removable top features high-tech, lightweight carbon fibre technologies to achieve a low weight of just 26 pounds. Currently owned by Volkswagen, Lamborghini is celebrating its 50th anniversary having been originally set-up in May 1963. 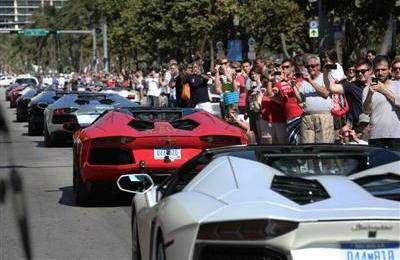 During 2012 Lamborghini sold 2,083 units around the world. Over 120 dealers around the globe market Lamborghini products. Following the financial collapse of the Sydney dealer some months ago, Australian dealers locations are restricted to Brisbane, Melbourne and Perth. Based on 2011 passenger movement figures, Miami International (MIA) is the world's 25th largest airport. It's the 12th largest in the USA. Its international passenger numbers make it America's second largest international airport (behind John F Kennedy International Airport (JFK) in New York). MIA handles more international cargo than any other US airport.